A drag chain conveyor is used for bulk material handling, particularly in any industries that deal with loose materials or pebbles. Drag chain conveyors are a type of industrial conveyor, specially designed to reduce the loss of the conveyed material, prevent material contamination, and to contain dust generated by the transportation of material. To achieve this end, drag chain conveyors are fully enclosed. This conveyor is comprised of a chain or cable, a long pipe, and discs, also known as “pucks.” The chain, or cable, runs through the pipe and the pucks, sized so they fit snugly to the pipe, are connected to the chain. To work, the pucks pick up material as they drag along the walls of the pipe, pulled by the chain. To ensure that any material that one puck drops, another will sweep up, conveyors feature several, if not hundreds of these pucks. Pucks may be made of metal or a synthetic material, such as plastic, and they are generally spaced out several inches to feet apart to allow for adequate storage space. The chain is flexible, making it possible to guide materials around the corner of the pipe, if necessary. The material with which a drag chain conveyor is made depends largely on what materials it will be handling. Generally, for conveyors moving materials that are corrosive or contaminable, stainless steel or an abrasion-resistant alloy will be the likely choice. For less sensitive materials, an inexpensive option is carbon steel. Materials that drag chain conveyors may transport include: alumina, dry ash, finished cement, bituminous coal, fertilizers, grains, limestone, malt, food meal, petroleum coke, phosphate rock, salt cake, dense soda ash, silica/quartz sand, sized wood chips, urea and calcined zinc. It is important that these materials are small, because drag chain conveyors are not appropriate for transporting larger items. In fact, they will likely jam if larger objects are placed inside them. Both chains and cables may be used with this system, but cables require regular inspections to check for frays, because they could lead to system failure. Well maintained drag chain conveyors offer many advantages to bulk material handling facilities in many industries. First, their total enclosure ensures dust and contaminant-free handling, which promotes worker health and wellbeing. 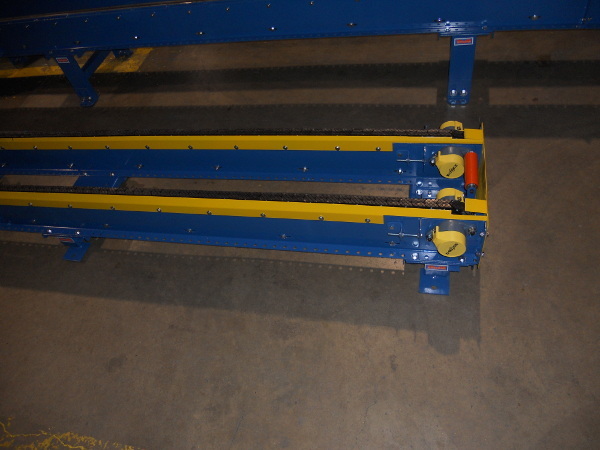 Second, drag chain conveyors are the only industrial conveyors on the market that can operate in three planes. This eliminates transfer points, permits complex circuits and allows operators to use only a single drive. In addition, when compared to other conveyors, drag chain conveyors use minimum horsepower and have an overall lower level of energy consumption. They also have a minimum noise level and gentle conveying action that reduces product degradation. Drag Chain Conveyor A drag chain conveyor is used for bulk material handling, particularly in any industries that deal with loose materials or pebbles. Drag chain conveyors are a type of industrial conveyor, specially designed to reduce the loss of the conveyed material, prevent material contamination, and to contain dust generated by the transportation of material. To achieve this end, drag chain conveyors are fully enclosed. This conveyor is comprised of a chain or cable, a long pipe, and discs, also known as "pucks." The chain, or cable, runs through the pipe and the pucks, sized so they fit snugly to the pipe, are connected to the chain. To work, the pucks pick up material as they drag along the walls of the pipe, pulled by the chain. To ensure that any material that one puck drops, another will sweep up, conveyors feature several, if not hundreds of these pucks. Pucks may be made of metal or a synthetic material, such as plastic, and they are generally spaced out several inches to feet apart to allow for adequate storage space. The chain is flexible, making it possible to guide materials around the corner of the pipe, if necessary.